Junior Julia Ruth mid-swing during one of the softball games. In softball or baseball, consistently getting solid hits is something that really doesn’t happen that often for an individual player. 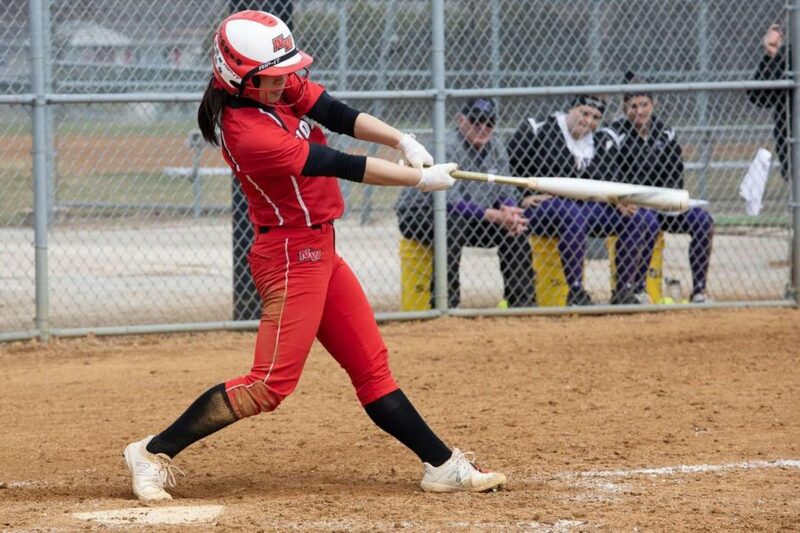 A good player will get around only three hits every time they step in the box — this isn’t the case for junior Julia Ruth who currently leads the CSL conference in batting average and RBIs. Ruth has been tearing it up this season at the plate with an outstanding amount of multi-hit games and a current total of three home runs. Her teammates have no doubt that Ruth is more than capable of achieving this goal as she has worked hard since the beginning of the season. “Julia has been such a huge contributor to the team this year and we all saw it coming. She works harder than everyone and is all around just a great girl to have on the team,” junior Katie Trail said. Softball has always been an important aspect of Ruth’s life, so when she steps on the softball diamond, she gives it her all. Ruth has been on the varsity softball team since her freshman year but didn’t really get to show off her skills and talent until her sophomore year. Many of her teammates who have been with her since freshman year see the difference in her game and how much she’s grown as a player and person. “Julia’s improvement since freshman year has been crazy and every bit of it she worked hard for and deserves it all,” junior Alana Mras said. Although her junior year has been more than exceptional and she still has her entire senior softball season, as of now, Ruth has no intentions on applying for an athletic scholarship and only hopes to continue playing for a club team after high school. Her teammates know all too well that no matter what she does, Ruth will work hard and has nothing but an exciting future in store. “Julia is an awesome person and no matter what she chooses to do after high school, I know she has a bright future ahead of her,” Trail said.